Dog are the most common pets owned by families. Our beloved pets bring much joy to our lives through companionship, physical exercise and their endless love and loyalty. On the other hand, our cute and cuddly four-legged friends can also cause harm, especially to young children, when we fail to recognize signs that a dog is going to bite. We can keep children and dogs safe by developing and applying simple rules for dog safety and bite prevention. In the United States there are about 78 million dogs with about 40% of families having at least one dog in the home. Unfortunately about 50% of dog bite injuries are to children. Bites are the second most common injury seen by emergency rooms. Dog bite fatalities by any breed are RARE. Many times these injuries are from an animal the child knows—the family dog, a friend’s or neighbor’s pet. The regularly reported incident is that the child was unsupervised and surprised the dog. Here are some simple ways to keep everyone—children and dogs alike, safe as we head into the warm summer months. Supervise all interactions of children, especially babies with pets. Even your own dog. Ask before petting or touching a dog. Especially if it belongs to someone else. Don’t corner a dog. Allow the dog to have plenty of space so it doesn’t feel threatened or scared. Avoid startling a dog. Don’t approach dogs that are sleeping, eating, or generally not paying attention to you. Do not try to take anything from a dog—like a treat, toy or food. They can get very protective of their things. Never chase, tease or harass a dog. Excited dogs are more liable to bite. Keep dogs leashed at all times. This keeps your pet safe from the unseen dangers of cars, people, or other animals. These are just a few examples of creating a dog safe family. As a result of using these examples with others, when you are out with your pet, you will educate other people on bite prevention and pet safety. Socializing the your pet, using positive reinforcement training, and making sure they get proper exercise are easy ways to promote dog safety and good healthy pet habits. As the saying goes “An Ounce of Prevention, Produces a Pound of Cure”. Similarly, this is true when it comes to creating healthy dog homes and preventing bites. Educating yourself and teaching children about dog safety at a young age is the key to prevention. The AVMA has developed a series of videos featuring Jimmy the Dog, a helpful pooch who shares tips for kids on how they can be safe around dogs and prevent bites. Follow #PreventDogBites on Instagram or Facebook to find and share more information about dog bite prevention. Visit the American Veterinary Medical Association (AVMA) and the National Dog Bite Prevention Week Coalition for more information. 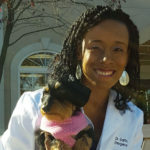 Dr. Gaffin earned her veterinary degree from Tuskegee University and completed a rotating internship at Purdue University. Dr. Gaffin joined Friendship as part of our Emergency & Critical Care team in 2018.